A few years ago I posted a series of articles from the now-defunct Tampa Times newspaper, about the strange genesis of the very odd eastern Creek Indian groups. With some of these groups once again seeking federal recognition, I think it is time again to bring these articles to light, and be reminded of who these people are. In my opinion, none are worthy of federal recognition. The T-Times newspaper no longer exists, and the rolls of microfilm of their back issues were tossed in the dump, so it is almost impossible to find a copy of their paper from the past. Libraries do not even have it in their archive collection. I have reprinted the articles here, and recently came across another Xerox copy of the articles, so I am adding the photos. I would encourage anyone to follow their ancestor’s culture and family traditions, but these groups are not even doing that—they are just making it up. And there are traditional families who carry on the old ways and traditions, but interestingly enough they are not seeking federal recognition and just want to be left alone. Modern day Creeks frolic in ritualized Indian dances which often have nothing in common with tribal Creek tradition, but provide a colorful and festive pageant all the same. This powwow, just outside Pensacola, is like many being held all over the Southeast by Creek descendants to return to ancestral ways. The Creek Indian nation east of the Mississippi has risen from the ashes left by Andrew Jackson’s infamous Indian wars of the 1800’s, with Creek descendants proclaiming for the first time their Indian blood, however thinned by generations of intermarriage. The Creek Indians were a mighty empire in the Southeastern United States until white encroachment, and were removed by the federal government across the Mississippi River in the 1830’s. A few Creeks hid out and escaped exile, and their descendants are now pursuing their ancestral culture—after many generations of “white” living. In the first of a three-part series, Times staff writer Jim Seale examines the new Creek movement. From the urban caverns of Atlanta to the hills of Tallahassee and across Florida’s panhandle to Alabama, a movement that started almost 30 years ago has emerged as a full blown socio-cultural phenomenon attracting the attention of anthropologists and politicians. The several thousand Creek descendants in the Southeast are donning colorful goose feather headdresses for weekend powwows, forming tribes and demanding and getting payment for historical wrongs done their ancestors. Anthropologists are sometimes baffled by their often unexpected mixture of Plains Indian trappings, Bible-thumping Protestantism, Creek Indian ritual and tourist-oriented commercialism. But if their fidelity to Creek tradition is often questioned, their new movement has rocked the American Indian world with its explosive growth. Escambia County, at the western tip of Florida, counted only 103 Indians in the 1960 federal census. Ten years later, the number calling themselves Indians quadrupled—with most of those claiming Creek ancestry. Escambia's seat is Pensacola, a hotbed of the new Creek movement. Within the last few years, they have won grants for extensive manpower programs, Indian arts and crafts classes and preschool day care. Some, urged on by businessmen, have grandiose plans for Creek Disneylands. A group in Cairo, Ga., plans a wholesale return to reservation, which is in its stages and is staffed with VISTA volunteers. The Creek nation, an empire of 55 towns located on rivers and steams (hence the name Creek) when confronted by Spanish explorers four centuries ago, came closer to cultural extinction than any other now active eastern tribe. After losing their final military battle to Old Hickory’s ragtag band of frontiersmen in 1814, the last mass of the Creek nation was removed in chains to Oklahoma—where a large tribe of Creeks now flourishes. A large number died of grief, starvation or exposure to the elements during the forced trek. But many other Creeks escaped the “Trail of Tears,” as historians call the removal of eastern tribes, by posing as whites or Spaniards—which was easy for some because by 1800 many Creeks had intermarried with fair-haired Scottish traders. It wasn't until this century that most dared to speak of their heritage. Most of the new Eastern Creeks are descended from the “closet” Creeks who dared not acknowledge their bloodline until more than 100 years later. These new zealots have retained few of the physical Indian features, and so have not been victims of racial discrimination. Many other Eastern Creeks today are descended from the fuller-blooded Creek community of Poarch, Ala., which was created when Andrew Jackson allowed a few Creeks who helped him exterminate other Creeks to stay on their East Alabama farmland. The brown skin, absence of facial hair and oval faces of their ancestors still appear in Creeks of Poarch and their children. They are among those who can remember being barred from theaters and fine restaurants as late as the 1940s. It was Poarch's group of Creeks—under the leadership of a poor dirt farmer named Calvin McGhee—who started the current Creek revival in 1947 by demanding equal education from their county school board in nearby Atmore. The successful campaign for integration snowballed into an ambitious lawsuit to get payment for lands taken from their ancestors. 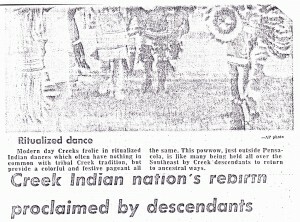 The Creeks’ claim was granted by the Indian Claims Commission in 1962, but it wasn't until 1972 that the checks, figuring out to $112.13, were sent to Creek descendants. The Indian Commission’s payment of $3.9 million amounted to 23 cents for each of the acres taken in an 1814 treaty. It was “only crumbs” but opened the door for federal aid to Creeks and other hitherto-unrecognized descendants of Eastern tribes, said Lenore Thompson, one of the Creeks’ lawyers in the claim. But the award also “opened the Pandora cash-box of commercialism” for the Creeks, as one Tallahassee Creek medicine man put it. No one would have to be one-fourth, one-sixteenth or even one-thirty-second Creek to get his share of the $3.9 million, under federal guidelines. All a Creek descendant had to do was trace his lineage back to Creek tribal newspapers. News of the award was trumpeted in newspapers all over the Southeast. “Everywhere, all of a sudden, they started coming out of the woodwork for the money,” said Buford Rolin, a 36-year-old Pensacola construction company office manager who attended Poarch's segregated “Indian school” while Calvin launched his campaign. Alabama farmers who had always feared professing their Indian blood, Pensacola factory workers descended from Poarch Creeks who migrated in the 1920s, Tallahassee bureaucrats never before interested in their lineage—all of them were suddenly hiring genealogists to link them with the ancient Creek nation. More than 7,200 in the Southeast were eventually paid their allotment, and they await the outcome of another pending claim for compensation for 5.2 million acres taken from Creeks in 1832. In the four years since the claim was paid, the Creek groups have retained and expanded their influence, and continue posting for the news media at colorful weekend powwows and performing western Indian dance routines in spacious new malls. After the weekend festivals are over, they return to their predominantly middle-class lives and jobs. His father’s ability to find herbs “that would break a fever” in the piney North Florida woods was one of the few bits of Creek knowledge left in his family when Huddy Steward was growing up. Stewart, now a robust 60-year-old retired Baptist preacher in Pensacola, is active in one of Pensacola’s five Creek clans and is teaching the members the ancient Creek language—Muskogee—from a manual. Like many of Pensacola’s Creeks, Stewart was born in Alabama and his farming parents migrated to Florida in search of higher paying industrial jobs. Stewart was born in the dirt farming country of Monroe County, Ala., but his part-Irish, part-Creek mother forced his father to move from their Creek community when Stewart was young. Stewart sits on the three-county Creek Indian council of northwest Florida which was created two years ago by the state legislature and which is setting up programs for Creek descendants. The Creek council in Atmore, Ala., near Poarch, is more than 10 years old and has even more extensive manpower and health care programs to care for Creek descendants. The Cairo, Ga., Creek group of Neal and Peggy McCormick, who were courted and recognized by then Gov. Jimmy Carter in a 1973 executive order, is building a self-sufficient Creek reservation on a few hilly acres. It will have homes, a health center, a small factory for making building materials and—for the tourists—a gift shop of Indian crafts and a re-created Creek village of 200 years ago. The tourist appeal, and the non-Creek trappings, make the new Creek movement little more than a money-grubbing scheme to some—including some Creeks. Gawking tourists and news reporters accept the big painted feathers and other apparel as genuine Creek. While members of Creek groups admit their ancestors wouldn't recognize most of their costume, they say it’s the only way a public nurtured on the photogenic John Wayne Indian will recognize them as Indians. Even the self-proclaimed chiefs of most Creek groups speak no Muskogee, but some Creek groups have Indian language experts helping them learn. Few Creek groups have the traditional ceremonial square, surrounded on four sides by palm-thatched arbors which encompass a sacred fire. Even Calvin McGhee, who founded the modern eastern Creek movement, never worshipped on a sacred Creek ceremonial square. And all but a purist Creek group in Tallahassee are nauseated by the thought of taking the bitter “black drink,” or scratching themselves with needles or animal claws until they bleed, as their ancestors did at yearly ceremonies to purify themselves. Some insist they are as Creek as their great great-grandfathers, but merely use different rituals. “A person can be Creek without causing damage to his body, and I don’t believe we’ll ever inflict wounds on ourselves,” almond-complexioned W. V. Williams, a Pensacola chief who is a deacon in his Baptist church, said while sitting on an overstuffed chair in his thickly carpeted living room. “I see the God I worship and the Great Spirit as the same,” said auburn-haired Ann Pate, a Pensacola Creek descendant, from a sparsely furnished office where she runs an Indian manpower program. But none will desert their Christian churches to worship the Creek supreme being, the Master of Breath. “This has no depth of meaning to us as a religion—a lot of the Creeks religious things weren't right,” said Stewart, a fundamentalist Baptist. Almost all of them desire to remain what some purists in the new Creek movement label “weekend Indians” and don’t plan to leave white society for reservations. The western Creeks in Oklahoma and Florida’s Seminole and Miccosukee reservation tribes see the eastern Creeks as white, middle-class hobbyists who have never suffered for their heritage as they have. “The question is, are the eastern Creeks really Indians?” said George Tiger, public information officer for the 24-member Creek council in Oklahoma. Some Seminoles and Oklahoma Creeks say they also have a grudge against their cousins because their ancestors joined the side of Andrew Jackson in the Indian wars. The Seminole and Miccosukee leaders deny the eastern Creeks’ charge that their representatives lobby in Washington against the Creeks getting funds. The eastern Creeks say their critics on the reservations really resent their splitting up the federal funding pie. “Chief Tommie would like there to be no Creeks left in Florida so he would get all the money,” said Perloca Linton, a Florida Creek leader. But despite assertions by other Indians that the new Creeks don’t comprise a true culture, anthropology departments of southern universities are sending their most promising graduate students to study the Creek groups. “They've taken the fact they can trace their lineage, and they've found a way to gain prestige though it—plus monetary gain they didn't have before,” the anthropology student said. That most Creek groups began around a commercial core is conceded by Rolin and almost all Creek leaders. Some Creek descendants are unhappy with the endless arts and crafts show circuit taken up by some of their friends. Rolin hopes that some of the novelty will wear off, leaving only those truly interested in their Creek heritage active in the movement. “That’s when I think they’ll come to have a deeper understanding of their ancestors’ culture,” he said. Many Creek descendants are like 45-year-old Carolyn McCaniel, a clerk who was not raised with knowledge of Creek culture and who joined a Creek group for the satisfaction of exploring her lineage. “Just for myself, I’d like to find out about the Creeks. I would like my children to learn the language and benefit form it,” she said. For Rolin, who doesn't need to wear beads and feathers to be recognized as Creek, simply exploring his lost Creek past and calling America’s attention to it is enough.